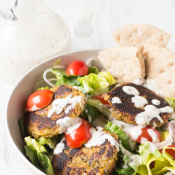 Ready to spice up your salad game? 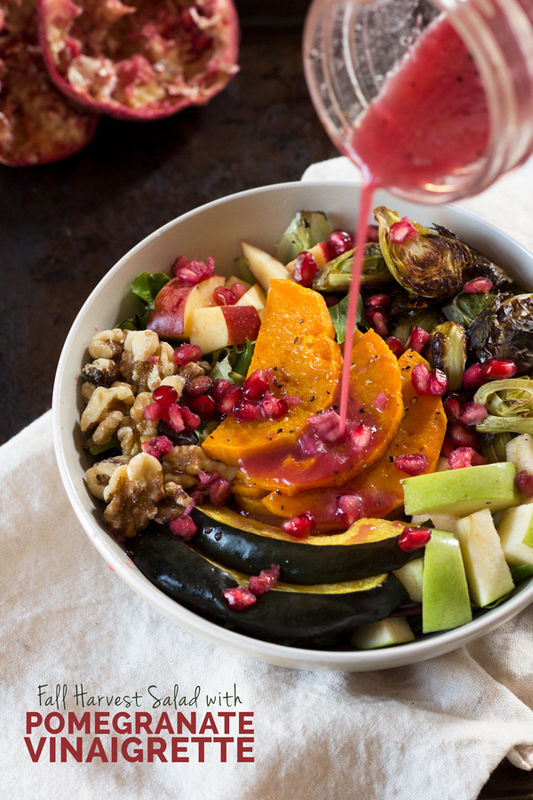 Try this fall harvest salad with pomegranate vinaigrette. 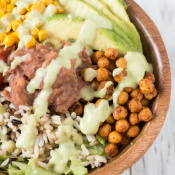 It’s easy to throw together, loaded with the flavours of fall and is vegan, gluten-free and paleo friendly. For some strange reason, my usual ‘eat all the sweets and carbs’ mentality has deserted me this fall. Sure, I still make and eat desserts. But my savoury food cravings have been through the roof lately. It all started with these rosemary roasted chickpeas and now I can’t seem to stop. I even had a savoury breakfast on Sunday, instead of my usual pancakes. I don’t even know who I am anymore. That being said, I’m still not much of a salad person. Despite being plant-based for almost 6 months now, I still find it kind of hard to actually eat plants on a regular basis. Oops. So this fall I challenged myself to get more veggies in my diet, without covering them up in baked goods. And of course, since I’m lazy AF, I’ve just been throwing together random salads on a daily. 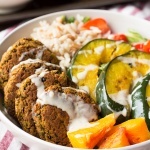 I’m not gonna lie, apart from the pumpkin falafel buddha bowl, most of them have been super underwhelming. 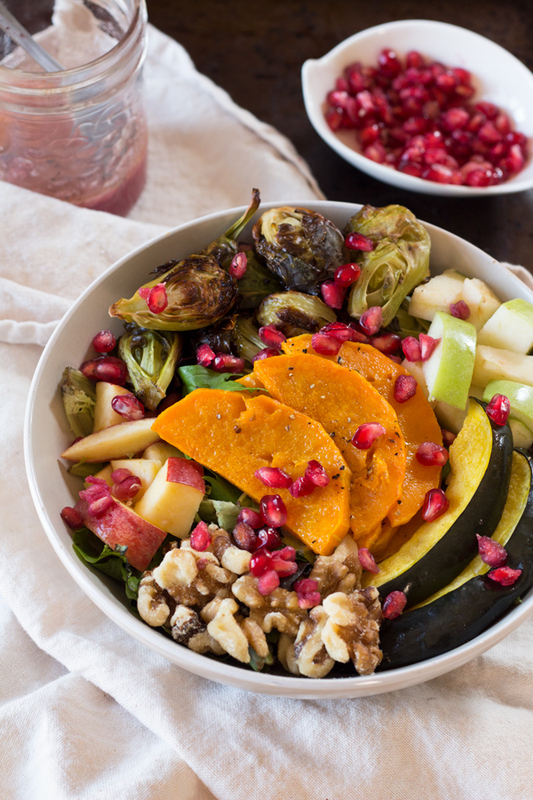 But when I stumbled upon the amazing combination of fall flavours in this salad, I knew I had to share it with you. 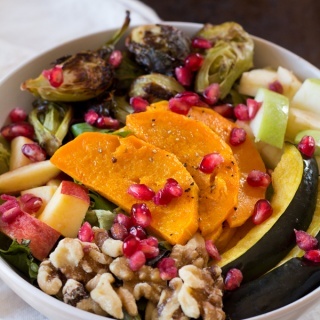 The salad itself is just a bed of greens topped with roasted squash, roasted brussels sprouts, apples, walnuts and pomegranate arils. 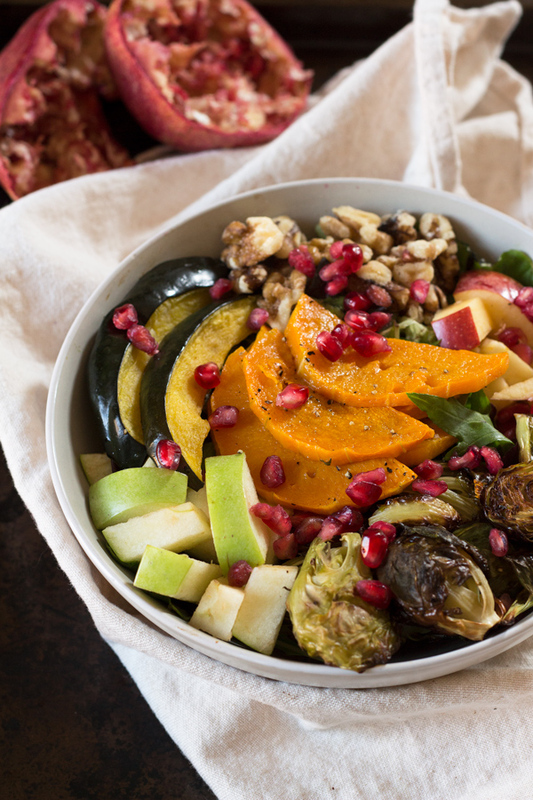 So basically all the fall produce in one bowl. It’s actually pretty good on it’s own, which is how I had it the first time around. But the sweet and tart pomegranate vinaigrette just takes everything to a whole other level. And the best part is, it only calls for 5 ingredients plus salt and pepper. 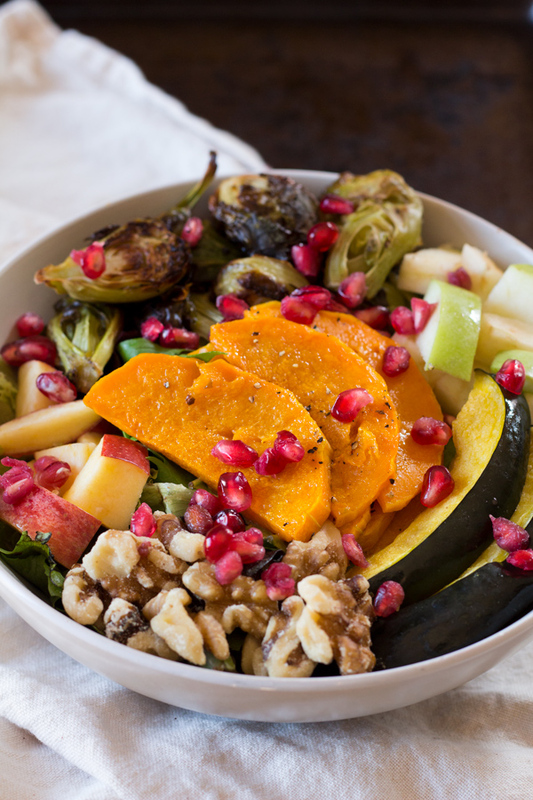 Honestly, if more of my meals looked like this fall harvest salad, I’d happily give up my sweets. Just kidding. Chocolate is life. 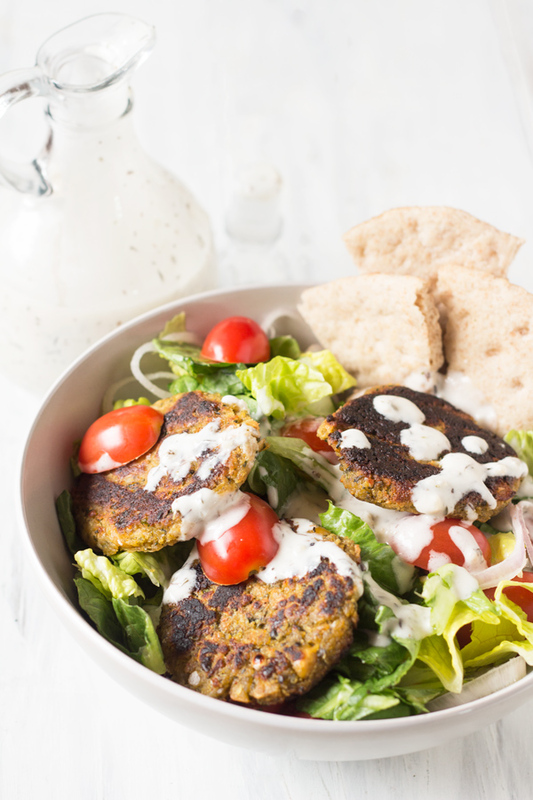 But this salad is pretty damn epic, especially when you throw the pomegranate vinaigrette into the mix. Project ‘Eat all the Salads 2016’ isn’t looking so bad. Favourite way to get your greens in? What fall produce are you loving at the moment? p.s. 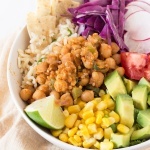 If you make this salad, I’d love to hear what you think. Leave a comment and rate the recipe or take a pic and tag it @ExSloth on Instagram! 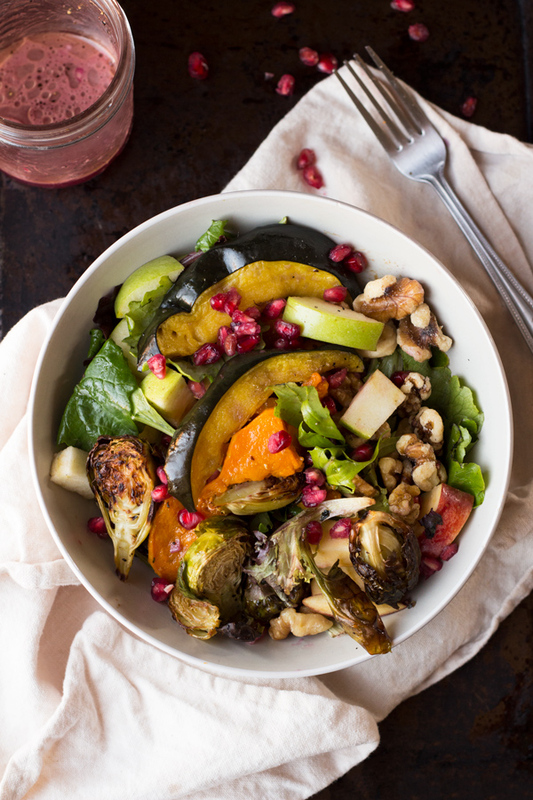 This fall harvest salad with pomegranate vinaigrette is easy to throw together, loaded with fall flavours and is vegan, gluten-free and paleo friendly. 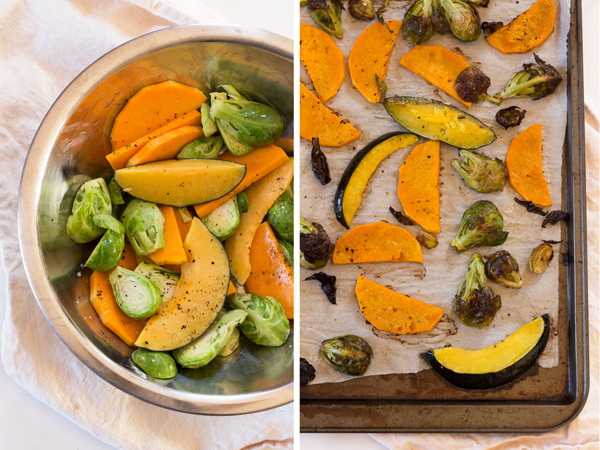 Well that would just be one pleasant belly-happy Fall meal! Yum!!! This is SO beautiful, Giselle! That pink dressing is EVERYTHING. salads are seriously such a simple lunch option that its the most attractive thing to take to work most days. i get it!! but this looks delishhhh usually im not a fan of fruit in salads, but damnn those pomegranate seeds look good. Girl you rock! What a yummy looking salad. Full of antioxidants and all that good stuff too!